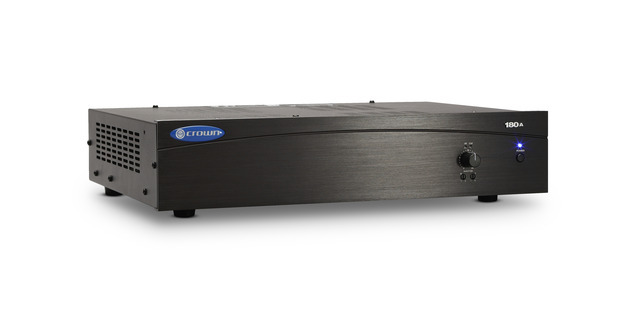 The Crown 180A, 280A, 1160A and 660A are high-value amplifiers for commercial and industrial audio. They provide 4-ohm and constant-voltage outputs (70V and 100V). The 660A, a six-channel amplifier, provides 4-ohm and constant-voltage outputs (70V and 100V) on channels 1 through 4, and 4-ohm outpus on channels 5 and 6. The amps are part of Crown’s Commercial Audio Series, which also includes mixers and mixer-amps. These low-cost units provide all necessary features in a simple building-block format. The sound system can be upgraded as a facility expands. For example, you can add more mixers for more inputs, or add more power amps (or mixer-amps) to handle more zones. For more commercial amplifier options, check out the JBL Commercial Series. 180A, 280A and 1160A have 1 or 2 inputs, 1 or 2 amplifier output channels.